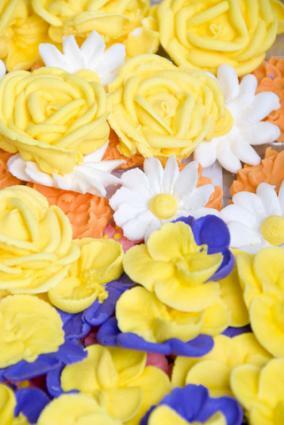 Royal icing flowers are beautiful and durable. Learn where to purchase them or how to make some for yourself. Royal icing is known as the "cement" of the cake decorating world. That's because it dries hard and has a matte finish. It's typically used to construct gingerbread houses, but it's also used to create beautiful decorations, including flowers. It's naturally white, but you can add coloring in order to create a variety of beautiful flowers for your cakes. You can make your icing from scratch or use royal icing mix for greater convenience. The key is to make sure your bowl and utensils are completely free from grease or your icing will break down instead of setting hard. It's always best to use fresh, disposable piping bags when piping with royal icing. Place the confectioners' sugar and meringue powder in a large bowl. Use a whisk to blend them until combined. Add more powdered sugar or water as needed to get proper consistency. The icing needs to be used immediately or placed in an airtight container for storage with plastic wrap covering the top. Royal icing begins to dry quickly, so your mix will begin to form a crust on top if you leave it exposed to the air. Keep a lid or a damp towel over the icing container to prevent this from happening. It's also a good idea to stir the mix before reloading your piping bag. Now it's time to learn how to create some of your favorite royal icing flowers. Pipe them on wax paper so the flowers won't stick. These are possibly the easiest flowers you can make with royal icing, and you can use them in almost any cake design. 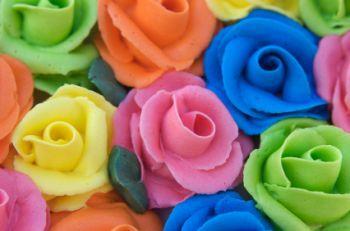 Attach a drop flower tip (225, 129 or 2D as examples) to a small piping bag and fill it with any color icing you like. Hold the bag straight up and down over wax paper just above its surface. Gently squeeze the bag and twist your wrist slightly as you do so. Once it looks like you have a complete flower, release the pressure on the bag and lift the tip away. Pipe a bead in the center using a small, round tip. You can use the same color and just switch tips on the original bag, or you can use a second bag of icing in a different color. You can make as many flowers as you need and allow them to dry on the wax paper. For this flower, you'll follow the same basic method as for the simple drop flower, but do not twist your wrist as you pipe. Daisies can be made in many sizes depending on which tip you use. Tips 501, 502, 504, 506 and 508 produce daisies in order from the smallest to the largest. Attach the tip you need to your piping bag. Holding the bag upright and using steady pressure, squeeze out just enough icing to create the flower. Release the pressure on the bag and lift the tip away. Use a round tip of appropriate size to add a center bead to your flower and use this technique to make as many flowers as you need. You'll need a flower nail to make these roses. Petal tips come in many sizes from small through large, but the 104 tip is the standard size most often used. Cut a square of wax paper and attach it to the flower nail with a small blob of icing. Pipe a small cone of icing in the center of the nail. Attach the 104 tip to the bag and with the thin end of tip at the top, pipe a single layer of icing around the cone to create the innermost closed portion of the flower. Pipe the first outer petal across the point where the inner petal begins and ends. Continue piping overlapping petals until your rose is as full as you want it to be. Gently remove the flower with the wax paper still attached and set it aside to dry. Prepare your flower nail with wax paper as you did for the rose. Attach a 101 petal tip to your piping bag. Starting near the center of the nail, pipe one small petal by moving out from the center, around at the tip and back to the center. Rotate the nail slightly, and pipe a second petal to the right of the first. Work your way around the nail until you have five petals of equal size. Using a size 1 or 2 round tip, pipe five beads in the center of the flower. Remove the flower and set it in a flower form so it dries with a slightly cupped shape. Leaves aren't completely necessary, but adding them to your flowers really helps bring them to life. There are eleven leaf tips ranging in size from the smallest at size 65s to the largest at size 115. The size 67 tip is a good general size to practice with. Attach a size 67 leaf tip to a bag of green royal icing. Starting near the base of a flower, gently apply pressure to the bag and allow the icing to build up a bit before you slowly pull the tip out as you pipe to create the length of leaf you desire. When you have the length you need, stop applying pressure and lift the tip away. Gently pinch the end of the leaf tip together. Don't be disappointed if your flowers don't turn out perfectly the first time you make them. Creating flowers is an art that has to be mastered, so practice making your flowers until you can make them just like the professional cake decorators. Once you can make these fairly easy icing flowers, you can move on to more complicated flowers like lilies, poinsettias and more.